Home renovation is one of the businesses that have gained huge grounds across the US and many other big places. Interestingly, the business is unlikely to wane in popularity as more and more homeowners are demanding renovation plans for their old-fashioned or dilapidated homes rather than building new ones entirely. Starting a home renovation business from scratch is quite easy as you may not have to enroll for any formal training before you can comfortably set your business in motion. In this article, you’ll find out most of the information you need to start a home renovation business from scratch and make a success out of it. Some businesses require you to have a proven set of skills that can convince potential clients that you’re worth hiring. Needless to say, home renovation requires you to possess these skills which include effective scheduling, efficient management, adequate planning, excellent designing and the ability to interact with clients. Whether you have all of these skills or not, it’s still advisable that you employ experienced people who should help you handle crucial tasks such as professional tearing down of old constructions and building of extensions, walls, additions, etc. Basically, every business requires you to complete some tasks in order to get it off the ground. Home renovation is no different in the sense that you’re required to put certain initial plans in place before eventually getting the business underway. Provided you’ve firmly resolved that home renovation is a suitable business sphere you can tap into, here are some of the initial start-up tasks you should complete. Nowadays, people consult attorneys, accountants, business advisers, etc., to help them decide the suitable structure for their proposed businesses. If you’re willing to establish your home repair business as an LLC, partnership or any other entity, you must be ready to shoulder all the responsibilities associated with your chosen entity. In that case, consulting your business adviser can help you in outlining the advantages and disadvantages associated with each of the entities. If you don’t want to be sued for duplicating another company’s name, it’s advisable that you create a unique name for your home renovation business. Obviously, one of the features that set your business out of the crowd is the name you choose for it. While it’s a great idea to choose a catchy name, ensure you’re not using a name that has already been taken by any of your competitors. A business logo not only fortifies your business profile but also keeps your home renovation business in the minds of clients. Once clients see your logo among other business logos, they will readily distinguish you from the crowd. If you’re really bent on monitoring the profit potential of your home repair business, nothing should stop you from equipping it with a separate account. All the earnings you realize through home renovation will be deposited into this account and this way, you can figure out if you’re making reasonable profits in relation to your business expenses. Insuring your home repair business is essential due to the damage or lawsuits that might occur in the course of business operation. Perhaps you should have an insurance policy that covers you, your business equipment and employees. Getting a business license is very essential as it’s a proven way to avoid operating your home renovation business illegally. The laws guiding business licensing –plus the requirements for obtaining licenses –vary from one state, province, county, etc., another. In order for you to find out the accurate licensing for your home repair business, do well to contact the authority responsible for the issuance of business licenses in your neighborhood. Importantly, take note of all the permits or licenses you need to get your business started and prevent being hindered by legal constraints. An office space is very essential as you’ll need a safe and reliable space for keeping your home renovation supplies and equipment when they aren’t in use. Moreover, having an office space is one of the things that set your business apart as a professional venture. Many clients like to contact business owners at their offices to inquire about services and to lodge complaints when necessary. 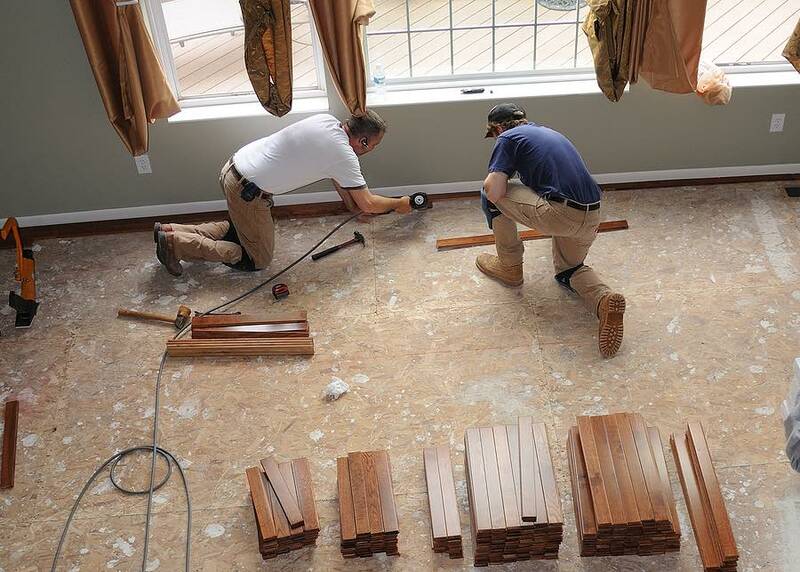 In order to rake in substantial profits, home renovation is best practiced on a large scale. With respect to this, there is a need to have different teams of professionals including electricians, plumbers, painters, framers, carpenters, and landscapers. Of course, these professionals will need the assistance of general laborers and as such, you’ll have to think over the cost of this. In buying equipment and supplies, you have to consider the tools the professionals you’re employing will need for carrying out renovation tasks. Power tools (including a portable table saw, jig saw, circular saw, driver, miter saw, reciprocating saw, etc.). Importantly, you’ll need a pickup truck and trailer to transport all of these tools and supplies from your office to where they are needed for the execution of home renovation. While there are several ways you can market a home renovation business, having a responsive website is one of the best marketing options that will enable you to compete well with your local competitors. Ensure you have a strong social presence with a massive following on Facebook, Twitter, and several other popular social networks. This will, of course, boost the reach of your business on social media. Also, ensure you create flyers and business cards which you can hand out to people at your site of operation and various other places.